One of the challenges of Chrome OS is when it comes to partitioned USB drives. Let me paint the scenario for you. Let’s say you have a 64GB USB drive that you were using as your Chrome OS Recovery drive for your Chromebook (I highly recommend you create one if you haven’t already). Now let’s say that you pick up a small 16GB drive for a few bucks and decide you want to have that as your recovery drive instead as it is a more efficient use of the drive space. After all, a Chrome OS recovery drive only needs about 4GB of storage. You create your new recovery drive and put it in a safe place. Now you plug in your old recovery drive and open it up in the Files app. There you will see the USB drive has two partitions: OEM and USB Drive. The problem is that if you reformat the USB Drive partition or the OEM partition, you will still have a partitioned drive. In other words, just like in Windows or MacOS, reformatting doesn’t get rid of a partition. You have to completely wipe the drive of data and partitions to get it back to one partition. Fortunately, within Chrome OS, there is a quick and easy way to do this using the Chrome OS Recovery app itself. In this How To, I will walk you through the quick process to take that multi-partition USB drive and reset it to one partition that is the size of the USB drive itself. As most readers will know, Chromebooks generally come with a small amount of built-in storage. The assumption, of course, is that you will be leveraging Google Drive for the bulk of your storage needs as well as USB drives that you attached to your Chromebook. 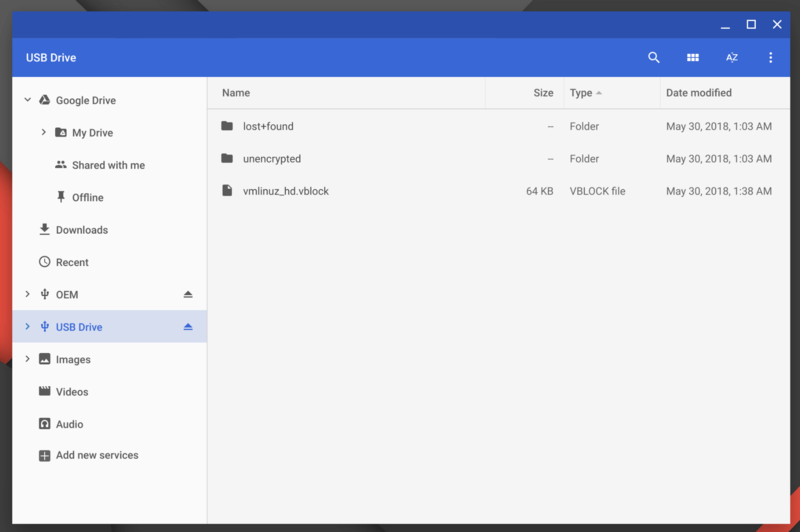 Chrome OS makes these solutions easy to access all from within the Files app. But how much storage do you have left in your Google Drive account or on that USB drive you’ve plugged in? Fortunately it is very easy to find out this information right from within the Files app in Chrome OS. In this How To, I’ll show you how to quickly see the storage available on any drive on your Chromebook. As a general rule, for most Chromebook users, the default apps to open particular file types will do the job. But sometimes you install an app, be it a Chrome OS web app or an Android app, and it takes over the behavior and becomes the default app for that file type. Sometimes that’s good, sometimes that’s not so good. Fortunately changing the default app to a new app for a file type is pretty easy in Chrome OS. The trick is finding it because it is not in Settings like you would find in your Android phone. In this How To, I’ll show you where you need to go in the Files app on your Chromebook to change the default apps. One of the hidden gems in Gmail are the labs. The labs are unsupported, experimental features that may make their way into the mainstream support for the email service. For the most part, I don’t recommend using beta or unsupported features but there is one that has been there a long time and Google seems to continue to improve it. The feature is the ability to enable an unread message counter on the Gmail tab in the Chrome browser on Windows, MacOS or Linux as well as in Chrome OS. In this How To, I’ll show you were to go in Gmail to enable the feature so you can try it out for yourself.